As appearing in La Papillote. Article by Jake Hauss ’13. Until a few months ago, the gold standard at The Culinary Institute of America was a room described by the New York Times in July as a “fusty, classically inspired, formal French dining room.” The Times’ examination of the venerable Escoffier restaurant was brought on by a drastic transformation currently taking place on the west side of Roth Hall. That article at the beginning of July gave most students, staff, and CIA groupies their first glances at what’s been rumored for years: the Bocuse Restaurant. 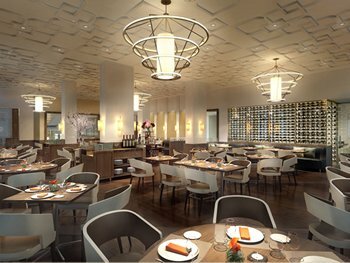 Slated to open in 2013, the Institute’s newest restaurant showpiece was designed by the same man who helps some of our most beloved restaurateurs make invaluable impressions on their guests every time the front door opens. Adam Tihany has been a force in the hospitality industry since the beginning of his career. With interior design and architecture credits at some of the world’s most well regarded dining rooms (Daniel, Aureole, Bar Bouchon in LA, La Fonda del Sol, just to name a few) Tihany was tapped by the CIA to take on the college’s most recent makeover. He was named Art Director by the Institute in July and will oversee, among other things, the overall image of the college’s Hyde Park campus. La Papillote recently got a chance to speak with Mr. Tihany after a lecture he gave to update students on Bocuse Restaurant. For more information about all CIA restaurants, visit www.ciarestaurants.com.